One of the things that struck me in Florida was the potential of ceramic wall art. I mean, sure, tiles have been kind of hovering in the background for years. I know they exist, and I know you can make beautiful things with them, but I’d never been somewhere so insistently decorated with them. 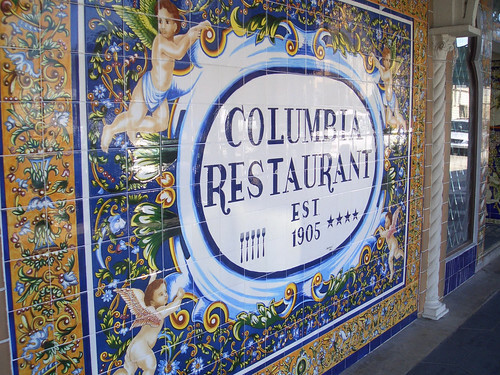 The Columbia Restaurant up there was the most glorious example, but there were cool paving stones and neat little tricks with brickwork and moulded cement and mosaics all over the place. St. John’s may be known for colour, but it’s not known for patterns or textures. We look just plain boring compared to some of the neighbourhoods down there. Anyways. I’m not to the point yet of room-wrapping mosaic pieces, but I would like to try my hand at some flat things to put on walls. Probably some small pieces, to start… they can be my new product at this year’s Fresh Fish. We shall see how it goes. Best. Mojitos. Ever. The pitcher came with sugar cane pieces stuck in it! Actually, that whole building is a work of art. Not just for the tiles, but for the stained glass, the woodwork, the archways, the balconies, the metalwork… Anything that could be carved was carved, and everything that couldn’t be carved was tiled or textured or painted something bright. That is absolutely beautiful! Love the tile idea. I think tiles outdoors in winter environments might be problematic, but I totally agree with coating the walls with them. One house in my art school days had a back splash for the stove that was made by one of the previous tenants. Little hexagons in earthy browns, greens, and blues. Oh, totally. They’d explode right off the walls soon as the freeze hit. But indoors? I’m totally tilin’ away someday.